[Server:server-one] 22:34:52,146 INFO  [org.jboss.as.server.deployment] (MSC service thread 1-3) Starting deployment of "my-webapp.war"
I have no idea how I can solve the problem. Can anyone help? Thanks! 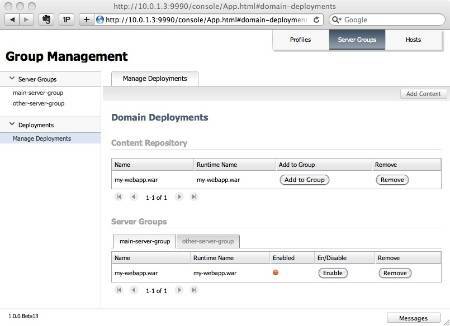 Have you done any changes to the clean installation of JBoss AS? Also can you please attach the entire server.log file? I've deleted the domain.xml from slave host. That's all what I didn't to the configurations, and haven't touch other parts of config(didn't add/remove any modules). The result is that the deployment not cannot be enabled. When I tried to enable it in server group it will report the error. Did you do any changes to the domain.xml in the "web" subsystem configuration? Can you attach your updated domain.xml? In this case you would either need to change the virtual host configuration in jboss-web.xml or you can set the "default-virtual-server" attribute in web subsystem to the host you defined. Should perhaps have been handled internally, isn't it? Instead of users having to do that. Thoughts? Hmm, perhaps. In case there is a single configured virtual server we could automatically make it the default, in case there a multiple we might still want to require either the attribute in the domain config or jboss-web.xml. Is that what you were thinking? Is there jboss-web.xml exists in AS7? I've searched the AS7 server dir and cannot find the file. I've also tried to find to documentations in https://docs.jboss.org/author/display/AS7/Admin+Guide but cannot find anything related to 'jboss-web.xml' or 'default-virtual-server' informations. Could you please provide any docs/ details on these configurations so that I can find a way to solve the problem? Thanks! You'll find that xsd at JBOSS_HOME/docs/schema/jboss-web.xsd. Where should the jboss-web.xml to put in? Should I put it in 'domain/configuration' ? Hmm, yeah at the moment you need to stop the processes first, then edit the configuration file for this to work.